Showing results for tags 'levelset'. Levels I built when I was 8-9 years old. They're silly. The whole set will only take around 10 minutes to complete. Enjoy! 5 levels I made between MO3's release and now. A brand new CC2 level pack by mobius, Inspired by Joshua Bone's "Walls of CC1" I decided to take on a similar project; for CCLP2! All of these levels are modeled directly after the levels from CCLP2 (the first big community pack of CC1). My overall rules and goals aren't exactly like Josh's WOCC1. I haven't always kept the level size 32x32 or left the walls untouched. But every level I've either tried to keep the basic overall shape or use a similar concept but CC2-ify it. Hopefully those familair with CCLP2 may be able to recognize the levels. The levels will be in the same order as the original pack so the difficulty curve may be all over the place as I'm not really trying to order the levels based on this; but since many of the earlier levels of CCLP2 were smaller and simpler these beginning levels ended up rather easier anyway. There are no tutorial levels however; I recommend getting a at least a decent understanding of the game mechanics before playing. CCLP2 was probably the first custom pack I played back in the day so this is very nostalgic for me. I also found it incredibly helpful for getting into making new levels again; after a very long writer's block. It was a very fun project and I definitely will be continuing it. There are currently 26 levels complete. The end goal is all 149; though I have no idea if I will be able to complete it or when. Thanks to Josh for the idea and other people here at CCZone for playing and giving feedback and advice. All feedback is welcomed, positive or negative. If a level is too easy or too hard; especially if it's busted, unfair or doesn't work properly I want to know. So after almost a year of relative absence from the game, I'm back! I'm between jobs right now, and the Seattle weather is nothing but rainy, so what better opportunity could I expect to dedicate some time to Chip's Challenge 2? I spent the last week or so dedicating myself to a complete Let's Play and levelset review of "Nanamin's Challenge 1.0" which was released by Nanamin on February 25th this year. I picked a brand new set by a designer I know nothing about for a couple reasons. First, the CC2 community has been somewhat dormant for some time (due in part I think to a poor editor and the ongoing CCLP4 voting), so I would like to do what I can to generate interest in the game. Second, I've never created a Let's Play video series before, and I wanted to try it out on a truly blind experience -- I've never seen any of these levels before. The videos are available on my Youtube channel at the following links: Part 1: (Levels 1-20)Part 2: (Levels 21-26)Part 3: (Levels 27-35)Part 4: (Levels 36-42)Part 5: (Levels 43-48)Part 6: (Levels 48-55)Part 7: (Levels 55-60) Summary: Nanamin's Challenge 1.0 is a wonderfully designed 60-level set with a medium difficulty curve. There are several themes I've noticed that run through the set: 1) The most common and most enjoyable levels are small, compact puzzles that always manage to bring together a variety of elements in some very creative ways. 2) There are a fair number of cooperative levels where you switch between Chip and Melinda. 3) There are 6 GRID MAZE and 3 CHAOS levels that are interspersed throughout the set and even act as a weak story line. 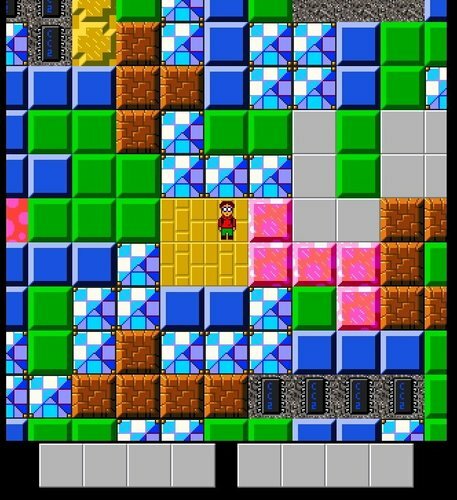 GRID MAZE levels take place on typically on repeating patterns of decorational walls, while CHAOS levels involve picking your way gingerly through unintelligible jumbles of tiles (think NONSENSE or SCRAMBLED EGGS form the original CC2 set). 4) There are bonus flags everywhere! I'm not an optimizer but this set would either be a dream or a nightmare. Curated Levels: If you don't have time to play through the whole set, I'd recommend the following subset of 10: 15 STRATEGIC DETONATION 23 THE WRONG FOOT 25 THE DUEL 26 GOLDILOCKS 30 THE SECRET OF THE BLUE SCARAB 33 THE ICE KINGDOM ADVANCES 39 OBSTACLE MACHINE 42 EXPULSION CUBE 48 COMPANION CUBES 50 CONTROLLED RELEASE And if you can only check out one level, please check out the masterpiece that is 48 COMPANION CUBES. Recommendations to the designer: 1) make more levels! these were great! 2) add a secret eye tool to 55 FLOODGATES. Remove or redesign the guesswork in levels 05 OUTBREAK and 29 GRID MAZE 3. Redesign 58 WATERFALLS to not depend on monster order. Redesign 19 DESICCATED SWAMP to add more depth to the gameplay. Individual level reviews: 01 MIRROR CUBE (Part 1, 0:50 - 10:24) Concept: (3/5) Design: (3/5) Puzzle Difficulty: (3/5) Action Difficulty: (1/5) Fun: (3/5) The highlight of this level was the interesting opening puzzle with the swivels, doppelganger, yellow teleport, and toggle doors. The enormous blue wall bonus maze and the lower room with all the arrows felt somewhat haphazard. On the plus side, it added a sense of exploration to the level, but it also felt confusing and space-inefficient. Using the TNT to pick up the last chip or blast through the walls to the exit felt loose. I thought it was a bug and demonstrated it in the beginning of my LP video part 2, but a viewer pointed out that the exclamation points suggest placing the TNT there. But with the final chip merely one room over it seems like it only saves a second or so. Overall a playable and decent level, but it feels like an amateur-ish introduction to what turns out to be an excellent set. 02 GRAVITY CURTAIN (Part 1, 10:24 - 11:48) Concept: (3/5) Design: (2/5) Puzzle Difficulty: (2/5) Action Difficulty: (1/5) Fun: (3/5) Another level that felt very loose and like it was thrown together fairly quickly. It is short and easy. I think the design falls short compared to some of the work that clearly went into later levels in the set. I think there is potential to turn the Melinda/gravel/force floor maze into something a little more creative. 03 WAIT (Part 1, 11:48 - 16:20) Concept: (3/5) Design: (4/5) Puzzle Difficulty: (3/5) Action Difficulty: (1/5) Fun: (5/5) After a slow start to the set this is the first real puzzle level that shows, in my opinion, what the set is all about. It's one of many small to medium sized levels that use diverse elements to create compact puzzles of surprising depth. The glider/bear-trap puzzle is nicely connected to the block/flame-jet puzzle. The interplay between the pink button wired to the flame jet and the orange button is instructional. The tank and button do feel somewhat underutilized however. I like the way the recessed wall section works to bridge the two halves of the level together. 04 FLOODMARSH (Part 1, 16:20 - 27:01) Concept: (4/5) Design: (3/5) Puzzle Difficulty: (3/5) Action Difficulty: (2/5) Fun: (4/5) I've always loved the 'maze within a maze' idea of levels such as SHORT CIRCUIT in the original CC1 game, or TRIPLE MAZE in CCLP3, for example. FLOODMARSH is a fun and easy entry into that category. 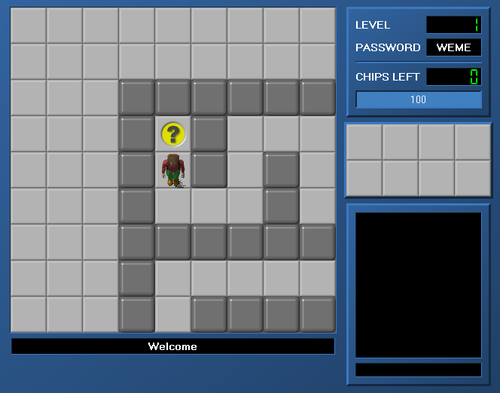 You initially navigate the maze as Chip (with flippers), and can use the water and floor paths. Once you gather all the chips, you transmogrify into Melinda and lose the flippers, taking the floor and chip socket route back to the exit. I appreciate the restraint in level size and the tight-but-not-terrible time limit. A nice concept executed well. 05 OUTBREAK (Part 1, 27:01 - 36:22) Concept: (4/5) Design: (2/5) Puzzle Difficulty: (3/5) Action Difficulty: (1/5) Fun: (2/5) I have mixed feelings about OUTBREAK. I think the concept is thoroughly unique (finding a route through a 'minefield' of block cloners and area buttons); however, the only thing that makes this implementation *barely* playable is the small size of the level. Upon further thought, I think one major factor bringing this level down is that the direction of each clone machine is not visible, so the gameplay is in fact a guessing game. I would suggest to the designer that an arrow marking on the floor next to each machine would help to make the level fair. 06 SHOVEL TEAM (Part 1, 36:22 - 39:39) Concept: (4/5) Design: (5/5) Puzzle Difficulty: (2/5) Action Difficulty: (1/5) Fun: (5/5) This is a simple, unique concept that ends up being an extremely fun and loose level to play. A great early level in a set. Fun to figure out what's going on underneath all the ice blocks, and then easy to execute. 07 DOUBLECROSS (Part 1, 39:39 - 41:15) Concept: (2/5) Design: (3/5) Puzzle Difficulty: (2/5) Action Difficulty: (1/5) Fun: (3/5) Average level, fun and quick to play. Not sure I 'get' it, but it works for an early level, especially for a player still learning the elements. 08 POOL PARTY WITH ANTS (Part 1, 41:15 - 46:27) Concept: (2/5) Design: (4/5) Puzzle Difficulty: (3/5) Action Difficulty: (3/5) Fun: (4/5) This is very much a gimmick level, but it works wonderfully as such. The wing boots are an underutilized design element. The level did a nice job of putting me into such a rush that I didn't see the 'twist' until I was just beginning to get frustrated. 09 ANTI SWAMP ZONE (Part 1, 46:27 - 50:34) Concept: (2/5) Design: (4/5) Puzzle Difficulty: (2/5) Action Difficulty: (2/5) Fun: (4/5) Another decent early-game level. The block pushing is both interesting and forgiving. The teeth, bowling ball, and perimeter of slime all contribute to the aesthetics. Great design rescues what might otherwise have been a somewhat boring concept. 10 BLOCK COURIER (Part 1, 50:34 - 56:31) Concept: (2/5) Design: (3/5) Puzzle Difficulty: (2/5) Action Difficulty: (2/5) Fun: (3/5) I don't generally like levels that require 'block-sliding' (hitting a moving block sideways off an ice or force floor), however this level is at least mercifully short enough to make the challenge fair, similar perhaps to ANNOYING WALL in CCLP3. (One nice bonus would be adding the helmet to protect the player). This level is also technically busted (see the beginning of the second Let's Play video), but the bust is creative and fun enough that it might be worth leaving in. 11 ANT NEST (Part 1, 56:31 - 1:01:24) Concept: (4/5) Design: (5/5) Puzzle Difficulty: (2/5) Action Difficulty: (3/5) Fun: (5/5) I loved this level. I liked the way that opening more doors in the level added to the number of ants milling about. I liked how the green door/yellow door balance ensured that Chip and Melinda both had roles and had to help each other out. The gravel squares in the center of each room ensured that the dodging wasn't too bad. Finishing the level off with a TNT blast was fun. 12 FORKPATHS (Part 1, 1:01:24 - 1:11:30) Concept: (4/5) Design: (5/5) Puzzle Difficulty: (3/5) Action Difficulty: (1/5) Fun: (5/5) A great concept with really great execution as well. I've struggled as a designer with using area buttons and force floors well, but this is a great use of the theme. At initial glance it seemed very intimidating, but it was fun to explore the paths, and it seemed like it was always pretty obvious which button to press next. It would certainly have been easy to make this level more unforgiving! A fun level to figure out. 13 GRID MAZE 1 (Part 1, 1:11:30 - 1:16:03) Concept: (2/5) Design: (3/5) Puzzle Difficulty: (2/5) Action Difficulty: (1/5) Fun: (2/5) The first of 6 levels bearing the name GRID MAZE. It's alright to play. The confusion of colors between the custom walls, floors, bombs, and bonus flags adds to the difficulty. Decent filler level. 14 DUAL CORE (Part 1, 1:16:03 - 1:19:35) Concept: (4/5) Design: (4/5) Puzzle Difficulty: (3/5) Action Difficulty: (1/5) Fun: (5/5) A great little block puzzle, fairly easy, and well-placed in the set. I love the use of both the green and purple toggle walls to add interest to the sokoban concept. 15 STRATEGIC DETONATION (Part 1, 1:19:35 - 1:25:52) Concept: (4/5) Design: (5/5) Puzzle Difficulty: (3/5) Action Difficulty: (2/5) Fun: (5/5) Another great little puzzle. Fun, short, and satisfying. Instructive on blue teleports. The order of doing things is non-obvious. 16 STAMPEDE (Part 1, 1:25:52 - 1:28:04) Concept: (3/5) Design: (3/5) Puzzle Difficulty: (1/5) Action Difficulty: (3/5) Fun: (4/5) Out and back monster-dodging. Memorable and fun. 17 SNOW PLOUGHER (Part 1, 1:28:04 - 1:33:28) Concept: (3/5) Design: (4/5) Puzzle Difficulty: (3/5) Action Difficulty: (1/5) Fun: (4/5) A deserving puzzle level. Possibly a minor bust since the ice block cloners change direction when blocked. Aesthetically pleasing due to diagonal symmetry. 18 FLIPPER (Part 1, 1:33:28 - 1:34:40) Concept: (3/5) Design: (5/5) Puzzle Difficulty: (2/5) Action Difficulty: (1/5) Fun: (5/5) A great and easy introductory puzzle level that requires planning ahead. 19 DESICCATED SWAMP (Part 1, 1:34:40 - 1:38:53) Concept: (3/5) Design: (1/5) Puzzle Difficulty: (2/5) Action Difficulty: (1/5) Fun: (2/5) A weak entry in the set in my opinion. The level is aesthetically pleasing and the concept has a lot of potential, but it feels thrown together and poorly designed. This level would work great as a 'maze within a maze' similar to FLOODMARSH, where Melinda goes through the whole maze to get the dirt boots, then collects the chips, then loses the dirt boots but can open chip sockets, etc. Instead, she gets the dirt boots halfway through the level, which opens pretty much everything up. There's a blue key and two red keys which don't make much sense, and then a key thief by the exit that seems to serve no purpose at all. 20 CHAOS ENCROACHES (Part 1, 1:39:04 - END) Concept: (4/5) Design: (4/5) Puzzle Difficulty: (4/5) Action Difficulty: (1/5) Fun: (5/5) The first of 3 'Chaos' levels (at the 20, 40, and 60 level numbers) is also my favorite of the series. It plays more like a puzzle (reminiscent of NONSENSE in the CC2 official set) than the other two which feel more like mazes. 21 GRID MAZE 2 (Part 2, 4:07 - 15:28) Concept: (2/5) Design: (3/5) Puzzle Difficulty: (2/5) Action Difficulty: (1/5) Fun: (2/5) I'm not a huge fan of the Grid Maze series in this set, although I do think they (for the most part) make good, short, filler levels, and serve to provide a sense of interconnectivity between earlier and later levels. This one for some reason really stumped me during my LP since I kept seeing a camo floor as a wall, but that was my fault. A decent maze level. 22 HOMEOSTASIS (Part 2, 15:28 - 19:01) Concept: (4/5) Design: (4/5) Puzzle Difficulty: (2/5) Action Difficulty: (1/5) Fun: (4/5) Fun to figure out, not terribly challenging but definitely some wrong paths to go down. Good puzzle with great aesthetics. 23 THE WRONG FOOT (Part 2, 19:01 - 26:42) Concept: (5/5) Design: (5/5) Puzzle Difficulty: (4/5) Action Difficulty: (2/5) Fun: (5/5) Love, love, love this bowling ball puzzle! We don't see enough of these... 24 LATTICE PALACE (Part 2, 26:42 - 28:52) Concept: (2/5) Design: (4/5) Puzzle Difficulty: (2/5) Action Difficulty: (1/5) Fun: (3/5) Nothing remarkable here, but it's a simple and fun level. 25 THE DUEL (Part 2, 28:52 - 35:25) Concept: (5/5) Design: (4/5) Puzzle Difficulty: (2/5) Action Difficulty: (3/5) Fun: (5/5) One of the few action levels in the set. Great use of bowling balls, going head to head with monsters. It's a tough concept to do well but this succeeds. The high point of the level is definitely the shootout with the four fireballs in the lower right corner. Very fun. 26 GOLDILOCKS (Part 2, 35:25 - 48:26) Concept: (5/5) Design: (5/5) Puzzle Difficulty: (4/5) Action Difficulty: (1/5) Fun: (5/5) Masterful puzzle, very compact, one of my favorites in the set! Nice take on the directional block/railroad track concept. The flame jet portion works beautifully. 27 PALACE DUNGEON (Part 3, 0:00 - 7:36) Concept: (3/5) Design: (3/5) Puzzle Difficulty: (3/5) Action Difficulty: (2/5) Fun: (4/5) Definitely a fun puzzle. I loved the bear trap/ant combo to allow pushing blocks around the level. The itemswapping at the end felt a little less inspired but it's a solid level. 28 DRAIN CLOGGER (Part 3, 7:36 - 10:54) Concept: (3/5) Design: (2/5) Puzzle Difficulty: (2/5) Action Difficulty: (1/5) Fun: (2/5) I like the idea of filling up the force floor to gain access to the other side of the level, but the block puzzle just wasn't very interesting. I'd like to see it reworked into a slightly less trivial sokoban. 29 GRID MAZE 3 (Part 3, 10:54 - 13:56) Concept: (3/5) Design: (1/5) Puzzle Difficulty: (2/5) Action Difficulty: (1/5) Fun: (1/5) Unless I'm missing something with the hints, this is purely a guesswork level. The hint tiles certainly do lie! At least the level is mercifully short. I would recommend removing this level entirely. Worst of the Grid Maze series, unless there's a puzzle with the hints that I didn't understand. 30 THE SECRET OF THE BLUE SCARAB (Part 3, 13:56 - 29:36) Concept: (5/5) Design: (5/5) Puzzle Difficulty: (4/5) Action Difficulty: (2/5) Fun: (5/5) Another excellent variety puzzle. I love the way the rooms connect, and how you make your way around the level and return to the start. 31 CONTAINMENT CHAMBER (Part 3, 29:36 - 32:30) Concept: (2/5) Design: (3/5) Puzzle Difficulty: (1/5) Action Difficulty: (3/5) Fun: (3/5) Decent level, I admire the attempt to use rovers. The fire squares make the dodging easy at least, although the monsters feel almost as random as blobs. 32 TANK! (Part 3, 32:20 - 36:24) Concept: (4/5) Design: (4/5) Puzzle Difficulty: (3/5) Action Difficulty: (2/5) Fun: (4/5) A solid design. Fairly easy level but it manages to feel very fresh. A lot of fun to play! 33 THE ICE KINGDOM ADVANCES (36:24 - 38:34) Concept: (5/5) Design: (5/5) Puzzle Difficulty: (1/5) Action Difficulty: (3/5) Fun: (5/5) Well done! I experimented with this concept a bit during the original CC2 design phase (see GLACIER and GLACIER 2 in the CC2 Rejects set) but they were pretty awful. This design does a much better job of giving the player choices without the solution being obvious. Great level! 34 PUSH'N'SWIVEL (Part 3, 38:35 - 48:03) Concept: (4/5) Design: (5/5) Puzzle Difficulty: (4/5) Action Difficulty: (1/5) Fun: (4/5) This level as well as EXPULSION CUBE do a great job exploring the 'sokoban with swivel doors' concept. Both are great puzzles and very satisfying to solve. 35 FLAMOSPHERES (Part 3, 48:03 - END) Concept: (5/5) Design: (5/5) Puzzle Difficulty: (3/5) Action Difficulty: (1/5) Fun: (5/5) Great concept, great use of the 'hide logic' feature. I think the level is just the right length for this idea. I like that taking the wrong path doesn't kill you immediately (similar in that respect to SPOOKS from CC1). Very unique level. 36 CORE (Part 4, 0:00 - 8:18) Concept: (3/5) Design: (4/5) Puzzle Difficulty: (3/5) Action Difficulty: (1/5) Fun: (3/5) I like the idea of getting all the blocks across to positions on the opposite side. The symmetric design is top-notch. Gameplay isn't going to be particularly interesting on a level like this but it works and doesn't take too long. I don't know if it was intended, but you can get away with some tricks by pushing blocks onto the force floors and then pushing them off on the other side of the level. I rescued my 1st attempt on the Let's Play this way. 37 GRID MAZE 4 (Part 4, 8:18 - 19:26) Concept: (3/5) Design: (3/5) Puzzle Difficulty: (3/5) Action Difficulty: (1/5) Fun: (3/5) Decent level, my favorite in the GRID MAZE series since it's more of a puzzle than a maze. It's hard to keep track of the different areas and what needs to be done, but in the end it comes together after a couple tries. 38 WASHOUT (Part 4, 19:26 - 26:08) Concept: (4/5) Design: (4/5) Puzzle Difficulty: (3/5) Action Difficulty: (2/5) Fun: (4/5) Really fun and unique design, satisfying to solve. I like the symmetry of the central puzzle while retaining the variety between the right and left 'wings'. 39 OBSTACLE MACHINE (Part 4, 26:08 - 40:58) Concept: (4/5) Design: (5/5) Puzzle Difficulty: (4/5) Action Difficulty: (2/5) Fun: (5/5) Another phenomenal 'variety' puzzle in a set that's already full of them. One of the best levels in the set. Great use of a lot of different elements. 40 SURROUNDED BY CHAOS (Part 4, 40:58 - 54:13) Concept: (4/5) Design: (5/5) Puzzle Difficulty: (4/5) Action Difficulty: (1/5) Fun: (3/5) The second entry in the CHAOS series is an awesome design! I don't even know how I'd go about designing a maze that works on this level. The level map even looks like a work of art. The gameplay is really frustrating at first but turns out to be quite playable. 41 COUNTDOWNER (Part 4, 54:13 - 58:07) Concept: (5/5) Design: (5/5) Puzzle Difficulty: (2/5) Action Difficulty: (1/5) Fun: (5/5) I really loved this puzzle. It makes a great tutorial on counter gates, yet without feeling like a tutorial. 42 EXPULSION CUBE (Part 4, 58:07 - END) Concept: (5/5) Design: (5/5) Puzzle Difficulty: (5/5) Action Difficulty: (1/5) Fun: (5/5) The ONLY things that might drag this level down are the two blocks that have pop-up walls underneath them. For this reason I'd recommend giving the player the secret eye tool. But even as it is, you discover those secrets fairly early on your first playthrough. The rest of the level is a top-notch, straightforward, and quite difficult puzzle involving blocks and swivel doors, and is one of the best puzzles in the set. 43 PARADIGM SHIFTER (Part 5, 0:00 - 10:08) Concept: (5/5) Design: (5/5) Puzzle Difficulty: (3/5) Action Difficulty: (1/5) Fun: (5/5) Another wonderful variety puzzle. Excellent use of the key and item thieves, as well as the connection between rooms. 44 OFF RAIL (Part 5, 10:08 - 15:10) Concept: (3/5) Design: (2/5) Puzzle Difficulty: (3/5) Action Difficulty: (1/5) Fun: (2/5) It has potential but didn't feel like it played very well. The long railroad tracks with recessed walls at either end felt somewhat reminiscent of CAMPGROUNDS (although not quite as evil). It seemed that to play the level 'right' you'd need to make a map. Fortunately it's short enough that I was able to take a random route and beat the level on my second try. 45 GRID MAZE 5 (Part 5, 15:10 - 19:25) Concept: (4/5) Design: (2/5) Puzzle Difficulty: (2/5) Action Difficulty: (1/5) Fun: (2/5) I've always loved the idea of the toggle wall maze that 'switches' half-way through to create a brand new maze. This level plays with that idea, but ultimately doesn't execute very well. The biggest drawback are the invisible walls that block off many of the exits, an unfair move that feels off-putting after you've essentially solved the maze. 46 GHOST TO GHOST (Part 5, 19:25 - 23:50) Concept: (2/5) Design: (3/5) Puzzle Difficulty: (2/5) Action Difficulty: (2/5) Fun: (3/5) A decent entry in the set, although the design didn't make a whole lot of sense to me for such a simple concept. It works though, and is pretty easy. 47 SPRING CLEANING: WITH ICE! (Part 5, 23:50 - 26:05) Concept: (2/5) Design: (3/5) Puzzle Difficulty: (2/5) Action Difficulty: (2/5) Fun: (3/5) Good filler level. 48 COMPANION CUBES (Part 5, 26:05 - End, plus Part 6, 0:00 - 24:45) Concept: (5/5) Design: (5/5) Puzzle Difficulty: (5/5) Action Difficulty: (1/5) Fun: (5/5) This level is simply a masterpiece!! Best level in the set, and one of the best custom levels I've played. It's not often you spend an entire hour solving a CC puzzle and feel like you wouldn't mind restarting and playing it again just to appreciate what just happened. The two thieves in the ice block room caused me so much grief, but that only added to the pleasure of circumventing them! 49 FOUR LINES (Part 6, 24:45 - 27:36) Concept: (3/5) Design: (2/5) Puzzle Difficulty: (2/5) Action Difficulty: (2/5) Fun: (3/5) A teeth level that works okay, but I'm not thrilled with the design. I love the idea of Chip clearing a path through the dirt for Melinda, and I love the idea of teeth that only follow the active player, but neither concept was really explored in much depth here. My solution was pretty much to just run for it, and since that worked it didn't feel like it had much depth. 50 CONTROLLED RELEASE (Part 6, 27:36 - 35:21) Concept: (5/5) Design: (5/5) Puzzle Difficulty: (3/5) Action Difficulty: (4/5) Fun: (5/5) Winning concept, and great process of discovery to figure out what is needed. Great blend of action and puzzle elements. One of the best of set. 51 PINPOINT (Part 6, 35:21 - 48:22) Concept: (4/5) Design: (5/5) Puzzle Difficulty: (4/5) Action Difficulty: (1/5) Fun: (4/5) This puzzle really wouldn't be that difficult if it was visible all at once, but being as spread out as it is, ends up being a very satisfying challenge. 52 MONOPATTERN (Part 6, 48:22 - 1:04:56) Concept: (3/5) Design: (3/5) Puzzle Difficulty: (3/5) Action Difficulty: (1/5) Fun: (2/5) Didn't care for this level much. The idea of using repeating patterns on the map reminds me a little of COLOR COORDINATION by J. B. Lewis, but isn't really put to good use here in my opinion. The problem is the patterns don't really serve much of a purpose or present a challenge in most of the rooms. The mazes are too simple, the turtles and recessed walls room can be solved in pretty much any way you feel like, the puzzles feel trivial. (Although I do like the final room with the ice blocks and fire.) I'd like to see the concept revisited with a little more care. 53 GRID MAZE 6 'FINALE' (Part 6, 1:04:56 - 1:11:44) Concept: (3/5) Design: (4/5) Puzzle Difficulty: (3/5) Action Difficulty: (1/5) Fun: (3/5) One of the better GRID MAZEs. The teleports are nicely confusing, and it's just the right amount of frustrating at first, but you learn the level after a bit. The time limit is short but fair (I beat it with 20 seconds left on my first try). 54 DON'T TOUCH ANYTHING (Part 6, 1:11:44 - 1:16:03) Concept: (3/5) Design: (3/5) Puzzle Difficulty: (2/5) Action Difficulty: (1/5) Fun: (2/5) Cool concept with two ways to win: either collect all the chips but no green key, or else collect both red keys without collecting all the chips. I will point out that the hint is incorrect, and the level is poorly named, because you may push blocks and collect green keys to your heart's desire, and still exit as long as you get both red keys and only 3/4 chips. Either way it's a very easy level, but feels looser than intended. 55 FLOODGATES (Part 6, 1:16:03 - END, Part 7, 0:00 - 12:19) Concept: (4/5) Design: (1/5... but 4/5 if the secret eye is added) Puzzle Difficulty: (3/5) Action Difficulty: (1/5) Fun: (1/5... but 3/5 if the secret eye is added) So... the hint says 'Think before you push' and 'Beware the outside', but as the level is designed you might as well 'pray before you push' and 'beware the inside'. The puzzle is actually quite a nice one in theory, but it plays horribly because about half the ice blocks have recessed walls underneath them, so just when you think you're clearing the path to the exit, suddenly there's a wall there and you've busted the level. Over, and over, and over. I eventually made a pen and paper map and recorded all the blocks that have recessed walls underneath, and then beat the level fairly easily and enjoyably, which proves that's it's actually a good puzzle. But it's unplayable as is. The good news is that simply adding a 'secret eye' tool should make it fair. 56 COCCOON (Part 7, 12:19 - 16:23) Concept: (2/5) Design: (3/5) Puzzle Difficulty: (2/5) Action Difficulty: (1/5) Fun: (3/5) It's playable, not one I'll remember. 57 BEHIND CLOSED DOORS (Part 7, 16:23 - 24:46) Concept: (4/5) Design: (5/5) Puzzle Difficulty: (4/5) Action Difficulty: (1/5) Fun: (5/5) A solid teamwork puzzle with a lot of nice variety. Very enjoyable. 58 WATERFALLS (Part 7, 24:46 - 39:27) This is the only level in the set I didn't beat. Initially it looked provably impossible. It turns out to be possible due to different behaviors from blocks on force floors depending on whether they are before or after the player in the monster order, but I personally consider that to be invalid as a puzzle concept. If there's a way around the monster order part, the level looks like an interesting puzzle, and I'd like to see it reworked so that it doesn't depend on that. 59 MANDALA (Part 7, 39:27 - 59:56) Concept: (4/5) Design: (5/5) Puzzle Difficulty: (4/5) Action Difficulty: (2/5) Fun: (5/5) A sprawling teamwork level, reminiscent of MELINDA 911, that stitches together portions of earlier levels, and manages to stay 100% fresh. I think my solution busted the level somewhat since I didn't need the force boots, but I kind of like that it's busted since there are several creative ways to win. 60 AND OUT OF THE CHAOS (Part 7, 59:57 - END) Concept: (3/5) Design: (3/5) Puzzle Difficulty: (4/5) Action Difficulty: (1/5) Fun: (3/5) The final level in the set, and the third CHAOS level. My least favorite to play, but still fun. Frustrating to pick your way through the maze, as I never felt like I could remember my past routes, felt more like feeling blindly the whole way. I really did not like the blue tank next to the red teleport, as it is too easy to accidentally die when exploring the teleports. I don't understand the cryptic hints, but would like to believe that there's an Easter egg there to discover. Also, does "Nanamin" equal "Alice Cox"? For a few weeks I have been working on a CC2 set, and I have decided to release a first version. Here it is: http://cczone.invisionzone.com/index.php?/files/file/504-c1059-cc2/ It contains 40 levels. Several are ports of CC1 levels I made with a few improvements thanks to CC2 tiles, others are entirely new. No music is included in this version. I may add some in later versions if there is enough demand. Please leave feedback! Thanks for playing! It's here. After a 3 year hiatus, TomB1.dat, known as Tom Brown's first official levelset, is finally receiving updates. It currently has 85 levels, which may be expanded at some point in the future. The levels start out with some beginner levels, and slowly gets harder as you go on. It has somewhat of a difficulty curve, so it is possible to come up on perhaps a challenging level later in the set. Some of the levels are levels that I originally created in my past, and have been modified to work in both rulesets. Most of the levels in this set are brand new and have never been created by me before 2015. All of the levels in this levelset are compatible in both rulesets, so you are able to choose which ruleset you would like to play for the levelset. Some of the levels in this levelset might be suitable for future official level packs. If you're interested in reporting scores for the set, the scoreboard can be found on pie guy's site. In other words, I guess that is all I have to say here. I hope you all enjoy it and if you have any suggestions or fixes that you want me to make, feel free to let me know on twitter, discord, and such. I have been working on a (CC1) set that includes insane levels. Here it is: http://cczone.invisionzone.com/index.php?/files/file/469-c1059-insanity/ Sorry about all the blank levels, but they are required for the warpstation to work. 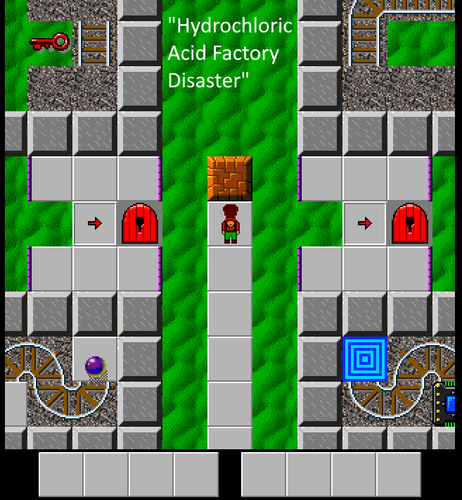 Most of the levels require MSCC to be solved, but some of them work in Tile World. Those levels have TW in the title. Thanks to Tyler Sontag, David Stolp, ChipHome5 and Mike Lask for helping me with this set! Please leave feedback. Thanks for playing! My first levelset, Cybersmack I. Please leave any feedback you have about the set, especially anything you expect to be a bug. Enjoy ------------------------------------ I consent to any of these levels being used in upcoming community CC1 levelsets. This is the second set of forty levels of my third (two-part) levelset, ZK3. In the spring of 2017 this levelset was revamped to improve overall level quality and become much more pleasing to play. This levelset in particular was originally designed to be very difficult and unforgiving, and while that is still a trait of the new version, the remake's difficulty has been adjusted to provide a more enjoyable and fun experience for all. Unlike the older sets, this one in particular has received the lightest change thus far. Many of these levels were not in need of heavy edits. If you wish to play the original version, it can be found under the oldest version below. It is quite similar to the new version, but may have a few errors. It's finally done! The sequel to Pit of 100 Tiles is here! This is my second levelset, again containing 100 levels. Some of the levels you may have seen already in CCLP1. Several levels here are highly unusual or experimental designs, and some are follow-ups to concepts seen in Pit of 100 Tiles. The set is of advanced difficulty compared to Pit of 100 Tiles, so I recommend you finish that set and either CC1 or CCLP1 before playing this set. Be on the lookout for secret hints in levels 10, 20, 30, and 40. You'll need them to solve Level 50. I submit all of these levels for CCLP4 consideration, but only want Level 50 to be considered if the player would be given hints to its solution over the course of CCLP4, similar to how it is in this set. I would like to heartily thank Michael Warner, J. B. Lewis, Tyler Sontag, Ryan J., and Josh Lee for playtesting this set and providing feedback. Their efforts kept probably a dozen busts out of the final product. Download the set here on CCZone: http://cczone.invisionzone.com/index.php?/files/file/230-the-other-100-tiles/ Download a CC2 port of the set here (work in progress, only complete up to Level 60): http://cczone.invisionzone.com/index.php?/files/file/488-the-other-100-tiles-cc2-port/ Current version (as of 4/16/2015, 12:47 PM): 1.100 Watch a trailer of the levelset here: http://youtu.be/J6nn4c8Z0UE Please leave feedback and bug reports in this thread. An MS rules version of my E_trilogy set. This is probably the final version of this set, but slight modifications might be made for playability issues if they arise. My third levelset, including 7 original levels! This is my first major levelset. It contains 50 levels. All have been tested and solved in both Lynx and MS, except level 49, which is Lynx only. Discuss here: http://cczone.invisionzone.com/index.php?/topic/930-c1059-1/ DAC files are included. I hope you enjoy these levels. Please leave feedback so I can improve future sets. This is a combination of my 3 level sets. They all start with the letter E, hence E_trilogy. This is probably the final version of this set, but slight modifications may be made for playability issues if they arise. This is the official topic for my newest levelset available here on the CCZone forums, ZK3: Damnation. This is the first of a two-part set, which contains forty new levels. Click here to download ZK3: Damnation: download page direct link picture of doge Thoughts, ideas, unsolvable/busted levels, or feedback - anything and everything is appreciated. Thanks guys, and happy holidays!